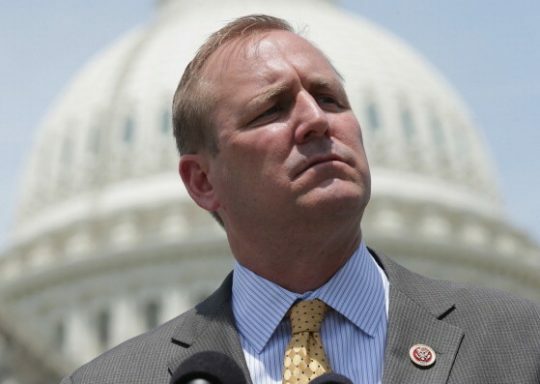 Progressive protesters lined up along a fence on Tuesday to protest Rep. Jeff Denham (R., Calif.) as he exited a vehicle, prompting one female protester to denigrate his Hispanic wife by saying, "Shame on your Mexican wife." The Modesto Progressive Democrats and other groups aligned with Josh Harder, a Democratic congressional candidate running against Denham in California's 10th Congressional District, were in attendance at the protest. Denham's campaign manager Josh Whitfield posted a video of the interaction on Twitter. "Clip of @ModestoProgDems & @joshua_harder allied groups yesterday. A protester attempts to race shame @JeffDenham's wife. You can clearly hear this person scream at Denham "Shame on your Mexican wife" This type of rhetoric has to stop, its fueling hate," Denham's campaign manager Josh Whitfield said. The female protester, who was holding up a sign in Spanish, not only called Denham "garbage," but also said "Shame on your Mexican wife" multiple times. It is unclear what several of the other protesters were chanting. National Republican Congressional Committee spokesman Jack Pandol also tweeted out the video of the incident, which led Harder to "like" the tweet. It was later "unliked" by Harder, but Pandol saved a screenshot. Denham slammed the Democratic candidate on Twitter Wednesday, saying it was "reprehensible" for Harder to endorse what was said about Sonia Denham, his wife of 25 years. "Absolutely shameful for anyone to attack my wife on the basis of her race. Reprehensible that @Joshua_Harder would endorse that attack with a like on social media," Denham said. "He should apologize. Sonia is an amazing wife & mother. We have been blessed with 25 years together." Absolutely shameful for anyone to attack my wife on the basis of her race. Reprehensible that @Joshua_Harder would endorse that attack with a like on social media. He should apologize. Sonia is an amazing wife & mother. We have been blessed with 25 years together. The NRCC slammed the "toxic and corrosive" culture among Harder's supporters. "Josh Harder needs to address the toxic and corrosive culture among his supporters to end these dangerous confrontations right away," Pandol said. Sonia Denham is not the first minority supporting his candidacy to be targeted. The GOP candidate sent out a statement earlier this week denouncing a hate crime against Surjit Malhi, the chair of Sikhi's for Denham Campaign Coalition, after he was assaulted on July 31 while helping place signs for Denham's campaign. "Mr. Malhi is a respected leader in our community & a proud American. This is the 3rd incident in less than 2 weeks members of my team were targeted. Hate Crimes have no place in our society. The people responsible for this reprehensible act of hatred must be brought to justice," Denham tweeted. This entry was posted in Politics and tagged 2018 Election, California, NRCC. Bookmark the permalink.